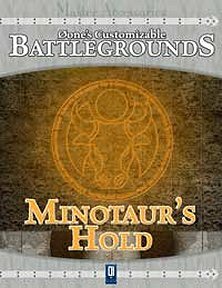 Primarily aimed at people wanting to run a miniatures skirmish - for which several scenarios are provided - this product would make an excellent map if a minotaur's lair happens to fit into your adventure (especially if you like to use miniatures for combat). Publisher's blurb: "Each product contains one king-size map (22" x34") and the same map divided in eight US letter sheets. Therefore, your choice is to print the whole map (maybe through a print server) or print yourself the single pieces and tape them together."